No one really knows who first said ‘the devil is in the details.’ But whoever it was spoke the truth. How many things have gone wrong or been delayed because someone forgot one little detail? How many brilliant ideas never made it to market? Or, having made it to market, turned out to be a complete flop? 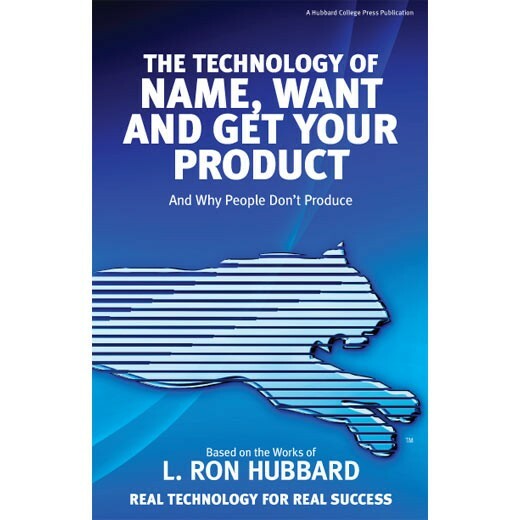 The Technology of Name, Want and Get Your Product lays out the precise details you need to bring your ideas, or your company, from where they are now to where you want them to be. This booklet is sold individually or in bulk. It is 8 1/2 by 5 1/2 inches, saddle stitched, and produced in the United States. You can give a booklet to a prospective client to provide a solution or you may just use it to introduce someone to the Hubbard Management System. They are also a valuable addition to seminars. They provide the attendees a written reference to take home and they increase the likelihood that they will apply the data that they have learned in your seminar. These booklets are also sold in bulk. You tell us how many you want and we give you a quote. The higher the amount ordered the lower the price per booklet.